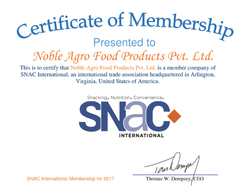 Established in the year 2007, we, “Noble Agro Food Product Private Limited”, are one of the illustrious manufacturers and suppliers of a wide range of Papads. Our range is appreciated for its purity,accurate composition and longer shelf life. 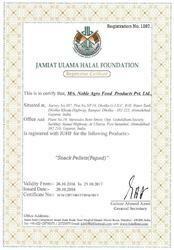 These food items hygienically processed using quality refined wheat flour, which is sourced from reliable vendors of the market. With the assistance of our sophisticated infrastructure, we have been able to provide these papads in diverse colors and shapes like heart, square, triangle, badminton and many more. The high-tech machines also enable us to fulfill the bulk requirements of our clients within the stipulated time frame. Moreover, the entire range is properly packed in a quality packaging material for retaining its properties. 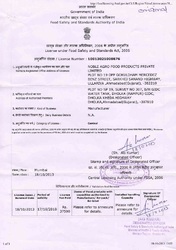 Rigorously tested by our quality controllers, these products are provided with private labeling. Through efficient marketing of the products at competitive prices and maintaining timely delivery, we have been able to gain a strong foothold across the nation. Our organization is constantly progressing under the dynamic leadership of our mentor, 'Mr. Mahmad Dharani.' Due to his visionary approach and ethical business policies, we have carved a niche in the domestic market. We are empowered by a diligent and dexterous team of professionals, which holds a rich industry experience. With constant support of these experts. We have been able to fulfill the set organizational goals in an efficient manner. Our experts tireless work, while ensuring smooth process of production. All the team members work in close coordination with each other, and strive hard to ensure uninterrupted production, packaging as well as delivery of Papads (Snack Pellets). We are one of the leading processors and exporters of a wide variety of Papads (Snack Pellets). We have two major categories; one is for Re-sellers (Importers/ Distributors/ Re-packers) and another is for Fryers (Ready to Eat snacks manufacturer who buy Raw Snacks Pellets from us than fry and add seasoning powder at their factory and sell it in small sachets under their brand name). This category is only for the Importers/ Distributors/ Re-packers, who will buy it from us as raw snack pellets and sell it either as it is or repack it under their brand name to the end customer. And end customers fry/roast it at their home. 1. Cereal based Double Layered (3D) Papads (Snack Pellets) [available in 12 Different Shapes in Two colors]. 2. Cereal based Single Layered Papad (Snack Pellets) [available in 4 Different Shapes in Two colors]. As I have mentioned above that we have separate FRY SPECIAL category for “Ready to Eat manufacturer / Fryers”. Features of Noble’s Fry Special? Fry special Snacks Pellets are less oil absorbing and also provides more crispness to Snack Pellets. It is less salty also so that after adding seasoning powder it will not taste very salty. The ingredients of Cereal Based Single layered and Double Layered Snacks pellets for both (Fry Special category and Reseller’s category) are same but Fry special product contains more corn and rice flour and less tapioca starch which provides crispiness to snacks pellets. Due to Small Size, the expansion rate of the Fry Special Papads(Snack Pellets) are also less so it is more convenient for Fryers to make small 25 Grams Sachet of Ready to Eat Snacks. 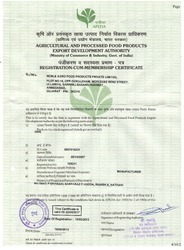 “To provide the best quality and wide varieties of product along with competitive price”.